Although garlic is best known for its culinary uses, particularly in Asian and Mediterranean cuisine, this herb also has been used for medicinal purposes for thousands of years. This herb is used in cultures around the world to help prevent heart disease and stroke, reduce the effects of diabetes and prevent cancer, according to Michael Castleman, author of "The Healing Herbs." Garlic may also have antifungal properties that can help prevent infections. The use of garlic and other herbs is not meant to replace conventional medical therapy. Check with your physician before using this herb to treat fungal infections or other maladies. Remains of garlic have been found in archaeological sites that are thought to be about 10,000 years old. Prescriptions for garlic were found on 5,000-year-old Sumerian clay tablets, and the herb was even found in the tomb of Egyptian King Tutankhamun. Greek soldiers ate garlic cloves before going into battle, and Greek midwives hung the herbs in homes to prevent disease and keep evil spirits away. More recently, garlic was used by military physicians in World War I and World War II to prevent gangrene, notes the University of Maryland Medical Center (UMMC). Garlic is a perennial herb that can grow to a height of about 2 feet. These plants produce multiple compound bulbs that are made up of about 20 cloves each, according to UMMC. The cloves are covered with a thin papery skin that can be removed by crushing the cloves with the flat side of a large knife. It is a member of the allum genus, which also includes leeks, chives, shallots and onions, notes Castleman. Garlic is thought to have originated in central Asia, according to the UMMC. However, it is now grown in temperate climates throughout the world, including much of the United States. Garlic has been known for its antibacterial properties for decades. When garlic cloves are chopped or crushed, a compound called alliin comes into contact with an enzyme called allinase, which forms an antibacterial chemical called allicin, according to Castleman. Allicin is effective for destroying fungi as well as bacteria, according to Susumu Yoshida, author of "Antifungal Activity of Ajoene Derived from Garlic." Ajoene, another chemical compound in garlic cloves, can also be isolated to produce even stronger antifungal properties. Ajoene has been shown to be effective against a variety of bacterial and fungal strains, including Candida glabrata, Trichophyton mentagrophytes and Staphylococcus aureus, although the specific mechanism for destroying fungi and bacteria is unknown. While few known side effects of using garlic for medicinal purposes exist, this herb may prevent blood clotting when taken in medicinal doses, notes Castleman. 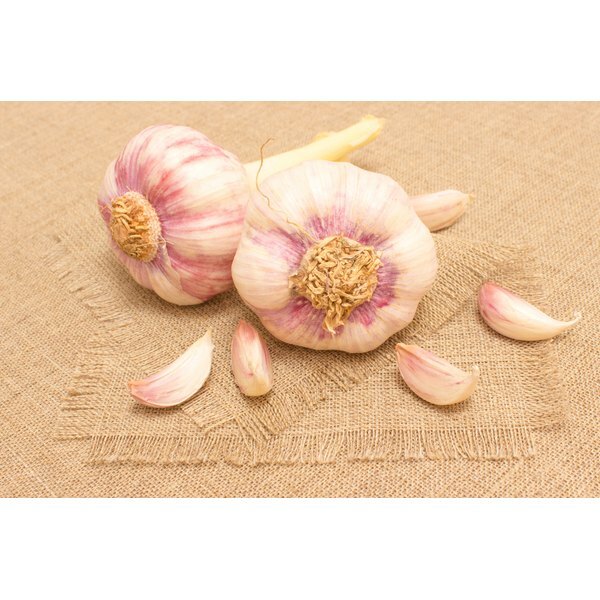 Up to a dozen cloves of raw garlic per day may be needed to prevent and destroy fungal infections. Those who have clotting disorders should consult a doctor before taking garlic, ether raw or in supplement form, as an antifungal remedy.